>TROPICAL STORM BONNIE IS BORN, HEADING FOR THE KEYS, LOUISIANA? 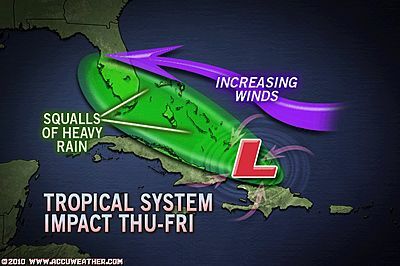 Well a new Tropical Storm is now on the map and it appears heading in a NW direction which would take it over the southern Bahamas and then over the Florida Keys, then out into the Gulf of Mexico where it appears pretty much all forecast computer models are taking Bonnie towards the central Louisiana coast. An upper low located west of Naples, Florida will be what holds Bonnie back from rapidly intensifying and as Bonnie journeys NW over the next 2-4 days, despite very warm waters in the 84-90 degree range, this upper low “should” move at roughly the same speed to the NW, keeping enough distance from this system to allow it to slowly intensify. However, the low is producing some SE shear overtop of the storm and will continue to do so, should Bonnie see an increase in shear from the upper low, then this may weaken the system somewhat. Right now I feel Bonnie may be a strong “storm” when it reaches the Keys and may have a window of opertunity once into the Gulf to become a hurricane.